Have you ever created a photo album, or wanted to make one? What if you could easily make a virtual one online? What if it could contain photos AND videos? What if you could capture a photo or video, edit it, throw in some creative touches, and add it to your photo album right on the spot? And what if you could show your photo album to all of your friends and family over the Internet? If any of that sounds interesting to you, then you're in luck! There’s an app for your smart phone or tablet computer called Instagram, and it can do all of these things! What’s more is that it’s so simple to use that many celebrities have their own accounts. Popular users include musicians/singers like Beyoncé, athletes like Lionel Messi, and movie and television stars like Ellen DeGeneres. Instagram is an easy-to-use mobile application that lets you capture and edit photos or videos on your tablet computer or smart phone. You can then share your creations on Instagram or other various social media websites, such as Facebook (which is currently Instagram's parent company), Twitter, and Foursquare. You should use Instagram because it’s an awesome multi-purpose app. It was initially designed to support social networks, but it has since become a social network all its own. Users can follow what other users post, or leave a “like” or comment on a photo or video that they find interesting. 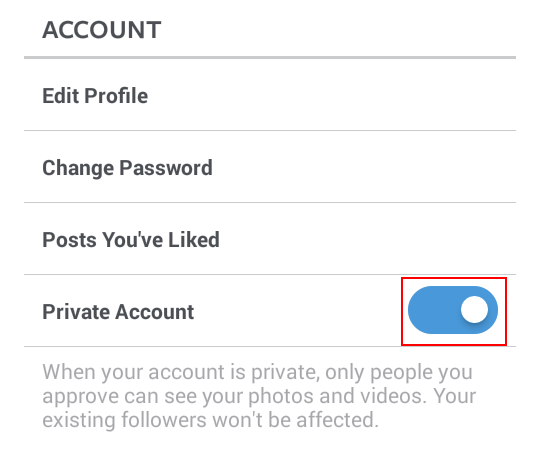 If you feel like being more private, users can require approval before other people are allowed to see their posts, or send posts privately to specific other users with the “Instagram Direct” feature. Instagram works as a photo and video editing tool, as well as a stand-alone social networking app. You can also use it to simultaneously share photos and videos across multiple social media platforms, and if you’re a business owner, as a tool to promote your business. Let’s go over 5 ways Instagram works. 1. Make connections with other users. Many other people use Instagram, from celebrities and corporations to budding photographers and blog enthusiasts. Some users may be your friends or family! You can connect with them and follow what they do, and they can do the same for you. 2. Show off your visual media creativity by sharing unique photos and videos. You can put photos and videos already on your mobile device on Instagram, or you can use the app to take a new photo or record a new video. After that, you can use filters and other effects to give a unique look to your creations! 3. Organize and categorize all of your posts to make them easier to find. 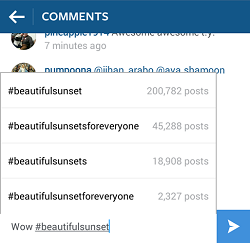 Instagram supports the use of “hashtags,” which are short words/phrases/abbreviations preceded by the “#” sign that you can add to your posts to help categorize them. This not only makes them easier to find for you, but it also helps other people find them as well! 4. Share your posts across multiple social platforms. Why just stop at sharing your photos and videos on one social network? Instagram allows you to connect to many other social networks, which means that you share photos and videos on Instagram and your other accounts all at the same time! 5. Change your account from "social" and "personal" at your leisure. 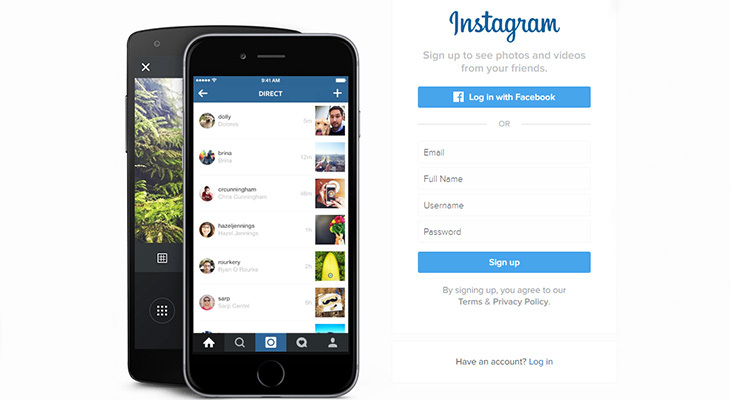 Are you the shy type who would rather use Instagram as their own private online photo album? No problem! You can set your account to private, which means that only people whom you approve as “followers” can see what you’ve posted. You can also use “Instagram Direct” to send a private post to a friend that only they can see, so it won’t show up in any public place on Instagram. If Instagram sounds like something you think you’d love, don’t forget to download it from the App Store for your Apple device, or the Google Play store for your Android. 1. 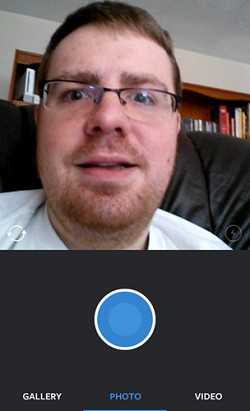 Use Instagram to capture photos and videos, and as an editing program. You can choose to upload photos or videos that are already stored on your mobile device or tablet, or you can capture photos and videos from within the Instagram app. The app also gives you the tools to edit your photos and videos. 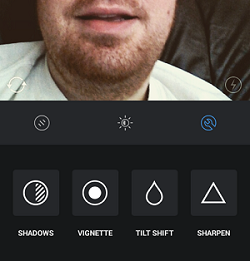 You can add cool filters to give a unique effect to your photo/video, or use the more advanced tools to further modify your photos before sharing them. 2. Use Instagram to share photos and videos across all your social media platforms. You can connect your other social media accounts to your Instagram profile so you can instantly share the same post across all of your social networks. 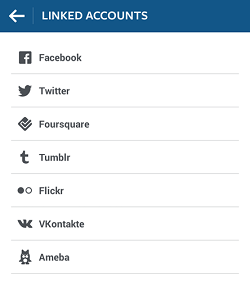 Some of the social networks that Instagram can connect to include Facebook, Twitter, Tumblr, and Foursquare. After you’ve linked your other social networks to your Instagram account, you can use it as a tool to share one post across all major social media platforms. 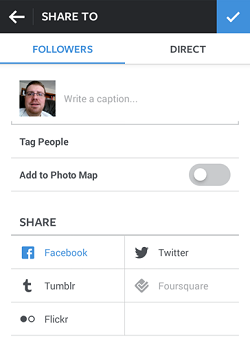 When you’re about to share a photo or video to your Instagram page, you can instantly share it across your other social networking accounts simultaneously. 3. Use Instagram as a social network to stay connected with your friends, family, and other users. You can use Instagram as a social network on its own. You can follow other users to see their posts on your timeline, and others can follow your posts as well. You can choose to follow your friends and family, your favourite celebrities, and your favourite brands. You can “like” other users’ posts, or leave them a comment to let them know what you think! Similarly to Twitter, you can use “hashtags” to categorize your posts according to their topics, or “mention” other users to connect them to your posts. 4. Use Instagram as a tool to promote your business. 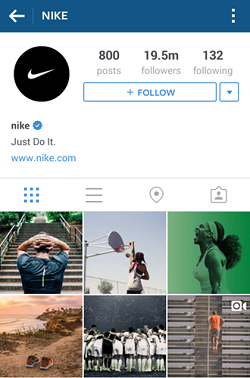 Lots of companies are now using Instagram as a way to promote themselves. Brands, companies, organizations, and businesses can create their own Instagram pages to promote their products and services. It’s a great way for companies to gain exposure, show off what they’ve been up to, or show sneak peeks at what they have in store for their customers! Instagram launched in 2010, and within one week had over 100,000 users. Three months after launching, Instagram hit 1 million users. The popularity and user-base of it grew rapidly from the very beginning, and has not stopped since. In the beginning, the idea behind Instagram was to provide users with a way to communicate through images. It has since blossomed into a multi-media social network. As it grew, the company was acquired by Facebook in 2012 for around $1 billion. Since being purchased by Facebook, many features have been added to Instagram, such as direct messaging and live streaming. Instagram, like Facebook, is now more of a one-stop social network with 600 million monthly active users. Instagram is just as safe to use as other popular social networks. As long as you don’t violate their terms of service, or do anything careless, you’ll be safe using Instagram. If you’re concerned about your privacy, you can set your profile to “private” so you can decide who can follow you and see your posts. If you’d like to learn more about how to stay safe using the app, check out our article on Instagram safety here. Instagram is free to download and use. You can sign up for an account, capture, edit, and post photos and videos, and use all of the app’s basic features for free as well. Since Instagram doesn’t charge its users to access the app or its services, it makes most of its money through advertising. Want to learn more about how the company makes money? Have a look at our article here. There are lots of reasons why Instagram is a great app to use, but there are also a few things that aren’t so great about it. Let’s go over a few of the pros and cons to help you decide whether or not its is right for you. First, let’s start with the pros. Some of the great things about Instagram are that you can capture, edit, and share photos and videos, all within the app, and all for free! You can choose from a variety of filters and built-in editing tools to give your photos a unique look. You can decide to share your posts with everyone, or set your account to private if you’d rather keep them to yourself. 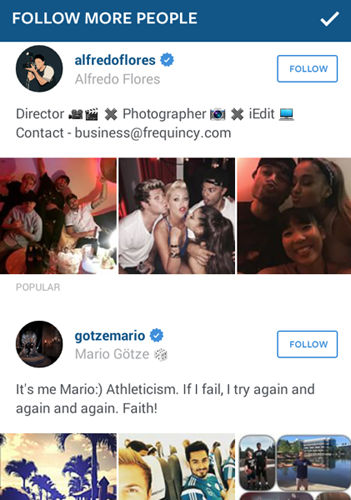 Tons of people use Instagram, so you’ll be sure to find other users to follow as well! Some of the not so great things about Instagram are that it’s designed for mobile devices, so you can’t post from your computer (without the help of a third-party app). Also, since all of its services and features are free, they sometimes show advertisements in your feed. If Instagram isn’t quite right for you, don’t worry – there are other similar apps and websites you can use instead. 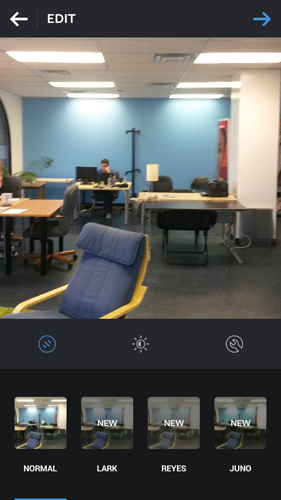 If you’re more interested in photo editing features than social networking features, try out VSCO.co or Pixlr.com. If you’d feel more comfortable using a photo-sharing service that’s been around for a long time, try out Flickr.com. If you’re looking for a unique social media network that includes photo and video sharing as part of its platform, check out Galaxia.co. If you want to learn more about the app and how to use it, we’ll show you the ropes! Check out the rest of our Instagram course, where we’ll walk you through getting the most out of Instagram – from installing it on your device and setting up an account, to producing, organizing, and sharing your photo and video creations. Read on to become an Instagram pro today! Note: This article was first published in 2016. It has been updated & new/additional content has been added.